This week's produce box contained all the fixings for another magnificent frittata -- sweet peppers, new potatoes, yellow cherry tomatoes, spring onions, basil and a half dozen pasture-raised eggs. 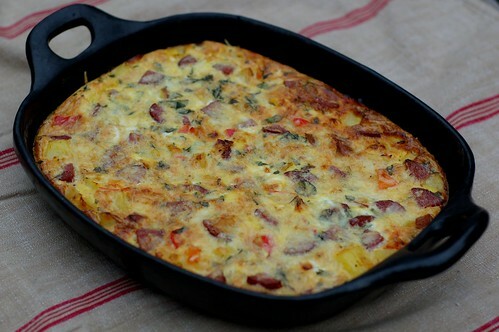 It was almost as if the farm gods were screaming, "Make a frittata!" Not wanting to piss off the farm gods, I did just that. With the addition of some Parmesan and cheddar cheeses and a little salami, this made a perfect main dish for brunch with some friends on Sunday. Since I have already waxed lyrical about the merits and origin of frittatas in an earlier post, I'm going to keep this one short and sweet and let the pictures speak for themselves. Enjoy! 1. Boil or steam the potatoes until just tender when pricked with a fork. Drain and let sit until cool enough to handle. Dice the onions and slice up the peppers. 2. Preheat the oven to 350 degrees. In a medium-sized frying pan or cast iron skillet, heat the olive oil over a medium flame (you will be baking the frittata in this dish so be sure to choose one that is both oven-proof and large enough to hold all the ingredients.) Sautee the onions in the oil for 5 minutes then add the peppers and cook another 3-5 minutes, until softened. 4. Grease a baking dish (you can use a pie dish, gratin dish or small lasagna pan) then arrange the potatoes, onions and peppers in a single jumbled layer and pour the egg, cheese, salami, basil mixture evenly over them. Top with the reserved cheddar. Bake for 15 minutes or until the eggs have set. Transfer the skillet to the oven and brown it under the broiler for 2 or so minutes (keep it at a bit of a distance from the flame if you can and be sure to keep a close eye on this since things can burn very quickly under the broiler) to brown the top. 5. Remove from broiler and allow to cool slightly then cut into generously sized wedges, and serve. 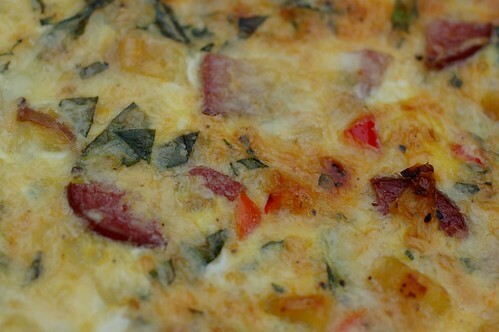 This is a fantastic frittata. We enjoyed it very much, and it was just as good the next day. Thank you for posting it.